Gerald Brom began his career as an illustrater for TSR’s Dark Sun role-playing world. Since then he has illustrated many novels, games, comics and film, including World of Warcraft, Magic the Gathering, Diablo, Doom, Batman, Galaxy Quest and Tim Burton’s Sleepy Hollow. He has written two award-winning illustrated horror novels: The Plucker and The Devil’s Rose. He lives in Seattle. Here’s his website. 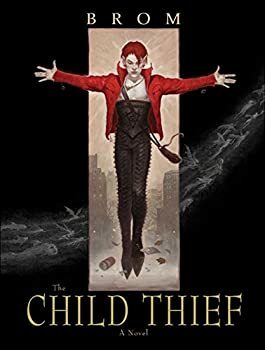 The Child Thief is one in a long line of novels, graphic novels, films, and cartoons concerned with giving “gritty retellings” of J.M. Barrie’s Peter Pan, or to give that book its original name and set it apart from the play, Peter and Wendy. The phenomenon of taking an innocent old classic and muddying it up is and has been fairly widespread, but Peter and Wendy is particularly popular because it was arguably gritty enough from the start, and authors like Gerald Brom consider themselves to be not so much twisting the story as advertising it in its original form. If you’ve seen any buzz about author/illustrator Brom’s newest novel, Lost Gods (2016), in which the words “Dante” or “Inferno” are heavily featured, I’d advise you to read that buzz with a pinch of salt; to rely on the similarities between Lost Gods and Inferno is to neglect the breadth and depth of Brom’s creativity and imagination, and I would sorely hate to see this level of world-building and inspiration reduced to the bare-bones concept of “guy goes to Hell” when there’s so much more presented here. 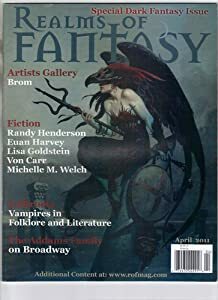 The April 2011 issue of Realms of Fantasy is identified as a “Special Dark Fantasy Issue.” The nifty cover illustration by Brom fits the theme perfectly. And there’s lots more Brom inside, including an interview by Karen Haber and a considerable number of examples of his work. This is a man who must use up his blue, gray, red and black paints with considerable speed -- but he never seems to use up his imagination. The Plucker — (2005) Publisher: The Plucker, now updated with new art and an afterword from world-renowned dark fantasy artist Brom, is a window into a world where fairy-tale tradition collides with vileness and depravity, love and heroism, suffering and sacrifice. In this shadowy land of make-believe, Jack and his box are stuck beneath the bed with the dust, spiders, and other castaway toys, and forced to face a bitter truth: Children grow up, and toys are left behind. Jack thinks this is the worst fate that can befall a toy. But when the Plucker, a malevolent spirit, is set loose upon the world of make-believe, Jack is thrust into the unlikely role of defending Thomas, the very child who abandoned him, and learns that there are worse ends for a toy than abandonment. As desperation mounts, Jack is thrown together with Thomas’s other toys — Monkey, the Nutcracker, and the ethereally beautiful porcelain doll Snow Angel—as they struggle to rise above their simple roles as playthings and save the boy they love. 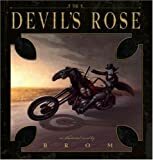 Devil’s Rose — (2007) Publisher: From the creator of the celebrated Plucker comes a frightening glimpse into hell and the afterlife. Escapees from the fiery underworld fill the richly illustrated pages of this novel set in modern-day Texas. They terrify and slay the living while trying to elude the guards who have been sent to round them up. Cole, one of the undead, has been sent to reclaim these souls in flight and return them to the fiery depths. But one escaped soul is not like the others: Rath, who in fact wants to return to hell. But why? And why does Cole, a tormented soul from hell, strive to capture his fellow hellmates? It has to do with a woman named Rose — a woman he has wronged — and a pact he made with the devil. Krampus: The Yule Lord — (2012) Publisher: Santa Claus, my dear old friend, you are a thief, a traitor, a slanderer, a murder, a liar, but worst of all you are a mockery of everything for which I stood. You have sung your last ho, ho, ho, for I am coming to take your head. I am coming to take back what is mine, to take back Yuletide… The author and artist of The Child Thief returns with a modern fabulist tale of Krampus, the Lord of Yule and mortal enemy of Santa Claus. One Christmas Eve in a small hollow in Boone County, West Virginia, struggling songwriter Jesse Walker witnesses a strange spectacle: seven devilish figures chasing a man in a red suit toward a sleigh and eight reindeer. When the reindeer leap skyward taking the sleigh, devil men, and Santa into the clouds, screams follow. Moments later, a large sack plummets earthward, a magical sack that will thrust the down-on-his luck singer into the clutches of the terrifying Yule Lord, Krampus. But the lines between good and evil become blurred as Jesse’s new master reveals many dark secrets about the cherry-cheeked Santa Claus, and how half a millennium ago, the jolly old saint imprisoned Krampus and usurped his magic. Now Santa’s time is running short, for the Yule Lord is determined to have his retribution and reclaim Yuletide. If Jesse can survive this ancient feud, he might have the chance to redeem himself to his family, to save his own broken dreams…and help bring the magic of Yule to the impoverished folk of Boone County.